The Precinct 75 Design Fair Returns again in AUTUMN!! 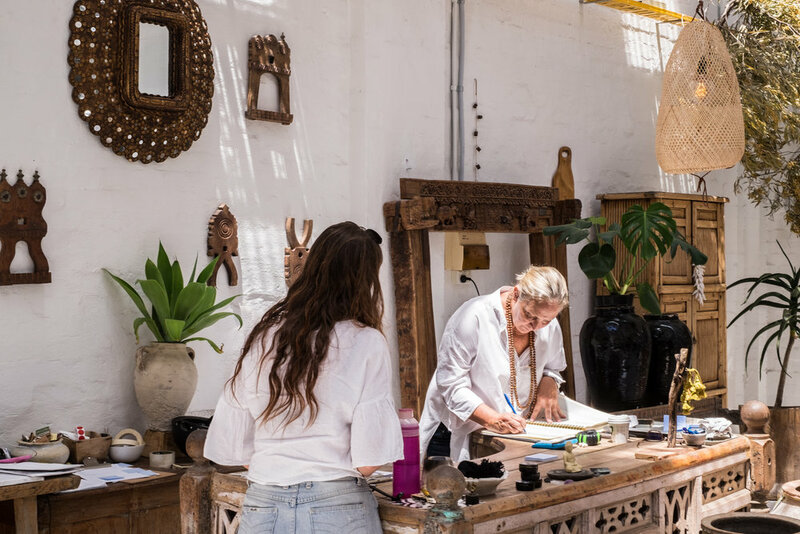 We will again host a one day Design Fair across the whole Precinct on 30 MARCH 2019 , showcasing not only our current design tenants (including Inartisan, Watertiger, Saarde, The Society Inc + more), but also a raft of guest homeware and fashion brands. Make a day of it – bring the family, the pets…... all welcome. Registrations & Stall Holder Enquiries, please email: bookings@thelifestyleedit.com.au OR fill out the form. Precinct 75 Design Markets curated by THE LIFE STYLE EDIT. Simply Wood is an industry leader for recycled timber feature walls, deck tiles, flooring and decking. With a versatile range to suit modern, industrial, rustic and organic designs, the modular systems are crafted with the designer, the commercial shopfitter and the mums and dads in mind. Quite simply, they take all the hard out hardwood. Drop in to pick up some samples, get a quick lesson on installation or get some help with choosing the right product for your next design project. Willie the Boatman brewers Nick Newey and Pat McInerney have developed beers that not only celebrate fine craft beer it also celebrate the community. Willie the Boatman have launched the ‘Tasting Room’ and would like to invite everyone for a visit to take a look their Micro-Brewery that operates at Precinct 75.......and of course taste their great ales. The Tasting Room is open every Thursday 4pm – 7pm, Friday 3pm to 7pm and Saturday 12pm to 7pm. Sherbet Birdie are Australia’s leading pin-up photographer, producing glamorous, sophisticated vintage photos from their cosy and luxurious photography studio at Precinct 75. A Sherbet Birdie pin-up photo shoot is once-in-a-lifetime experience, where you’ll get to dress up, sip champagne and become a classic, vintage pin-up girl of 1940s glamour, 50’s cheesecake or retro style. With a little help from the friendly, professional team at Sherbet Birdie, you can recreate that delicious look of an era past and take home amazing pin-up photos for you (and your loved ones) to treasure forever. A must Visit Destination Experience for the Curious! Interior stylist Sibella Court has created a sophisticated, beautiful experience in a unique space. Celebrating design and tailored craftsmanship, The Society Inc. is a sensory experience that is forever changing and never finished. The design studio also facilitates regular workshops and events. Treasure-trove of handpicked and bespoke mix of wares to browse and take home. Established in 2017, The Rice Pantry was created in recognition of their favourite and most widely eaten staple food - RICE. It’s simple, versatile and can be eaten any hour of the day. Vanity by Design was established from our passion to create beautifully crafted and designed bathrooms. Our in-house design team is committed to offering unique quality products that are designed with an emphasis on current bathroom trends and style. For over a decade we have provided homeowners and interior designers access to our distinctive range of both traditional and contemporary vanities and bath ware. If you appreciate style and quality, we invite you to discover our range of inspiring bath ware. Working with artisans from Australia and around the world to create unique handmade pieces of the highest quality. With a strong commitment to creativity, the environment and ethical production, Inartisan values individual craftsmanship and artistic integrity over mass-production. Visit Inartisan for a creative fusion of designer furniture, baskets, home decor, lighting and phosphates candles. Maniax are up and 'throwing', this exciting new recreational sport is now open at Precinct 75. If you are looking for something different, get your friends and colleges in to try out your axe throwing skill!! For more information or to make a booking, take a look at www.maniax.com.au. Ready for your new look.......the Colour and Hair Specialists at DD&Co are ready to help! DD&Co have expanded and now opened their doors at Precinct 75. With internationally trained staff and over 15 years of experience, DD&Co are your go to hair colour specialists. The staff at DD&Co will go the extra mile and exceed any expectations by pushing the boundaries with what they can achieve with your hair. Delivering clients a relaxing and professional experience where you can spend hours sitting in the modern industrial fit-out with a Soho N.Y.C feel. They haven't forgotten about the guys either, providing a speak-easy barber for all you men looking for your too fresh for death cuts. Multi award winning Sample Coffee from Surry Hills is now operating at Precinct 75. Sample Coffee is a must visit destination for both coffee connoisseurs and coffee lovers alike. Sample Coffee have a traditional 1957 roaster operating on site. The coffee-focused cafe with great food also offers a Pro Shop stocked with a wide range of brew gear to help you make awesome coffee at home. Sample is open Monday to Saturday serving great food, drinks and coffee. Usfin Atelier is a genderless hair salon and event / gallery space. Besides running and facilitating hair seminars with hair stylists from salons across Australia, Usfin Atelier regularly collaborates with various emerging artists and creatives, giving them a platform to network and exhibit their work. Usfin Atelier has a team of international hair artists who are always learning and innovating to deliver what their fashion forward and knowledgable clients want. Led by creative director Daniel, Usfin Atelier specialises in creating bespoke, fashion forward hairstyles. Taking up the middle floor of Building 7, The Art Room studios is a creative co-working space with 17 different designated spaces. An eclectic mix of architects, designers, artists and small start-up businesses all working alongside one another. We have a workshop space where you can enjoy a variety of creative classes. Helen Laura Ashley trained as a Textile Designer in the UK and has worked in the design industry for over 25 years. She now illustrates both in paint and porcelain, drawing and sculpting things she loves from nature and her surroundings, never making the same thing twice so you get something truly unique and quirky. Helen’s original artwork is licensed to several Australian homeware companies. You can find her in her studio in building 7, The Art Room Studios, a co working creative space she also manages. The first photo is of Workers at Precinct 75 in the early 1920's and is taken behind what is now known as Building 5. The second photo is of Workers at Precinct 75 in the late 1930's and is taken in-front what is now known as Building 1 where the Sample Coffee Cafe is located. The third photo is administration and technical staff at Precinct 75 in 1941 and is taken in-front the main entry to what is now known as Building 2. Want to join the Precinct 75 Community? Precinct 75 currently has several newly refurbished spaces available for creative businesses to join the Precinct 75 community. Take a look at our Available for Lease page for more information and to arrange an inspection. Aisle6ix are a thriving, homegrown, traditional screen-printing company based at Precinct 75. With strong connections to Australia’s art scene, Aisle6ix Industries places an emphasis on bold, artist-driven designs, with the ability to print t-shirts, posters and a wide range of other media. Basically, if they can get it flat, they will print it. Call in for a visit and and see how traditional screen printing is done by the best. Water Tiger was born out of an appreciation and passion for Asian sensibilities and artifacts. The Water Tiger showroom at Precinct 75 displays a fusion of ancient and modern designed and crafted pieces. The collection honours the craft, history, lineage and passion of the artisans that created these beautiful things. Visit and enjoy the range of antiques and newly crafted furniture, soft furnishing and homewares. Precinct 75 welcomes all visitors, feel free to take a walk around and enjoy the unique and historic environment. The Precinct 75 Markets will return in mid 2018......keep an eye on our Website for dates. Hope you enjoyed the Winter Design Fair in July, we are now planning for the Spring Design Fair.........to be held on 1st of September 2018. Precinct 75 has recently lodged a Planning Proposal and Development Application with the Department of Planning and the Inner West Council. This proposal seeks to create a new benchmark for sustainable mixed use development within the Inner West LGA. Our proposal aims to renew the space for living and working and in turn, continue to celebrate the local community’s creativity and assist its transition into a thriving and creative urban village. A Planning Proposal to rezone the existing site from IN2 Light Industry and R2 Low Density Residential to B4 Mixed Uses was lodged to the Department of Planning & Environment in August 2017. Subsequently, a Development Application was submitted in November 2017 for a mixed-use development which aims to retain existing creative commercial spaces while providing additional commercial spaces and new residential properties. The aim is to retain and enhance Precinct 75’s existing industrial fabric while adding spaces that enables live / work balance by introducing additional creative commerce studios and residential apartments while replacing old tin sheds with open green spaces. • Access: linking local public transport networks and pedestrians as well as encouraging alternate forms of transport. • Community: evoking a sense of place and creating community spaces. • Landscape: open, green spaces. • Creative Industries: retaining the existing character of the site as a local creative industry precinct. • Live/work: suitable for small businesses. • Encourage employment: supporting the ongoing use of the site for creative production. • Sustainable development: incorporating ecologically sustainable design principles into the design, construction and operational phases of the development. • Partial demolition across the site. • Alterations and additions to existing buildings and construction of new buildings to create a mixed-use development that includes 178 residential apartments and approximately an additional 2,500m2 of commercial gross floor area (GFA). • Associated basement car parking. • Landscaping works throughout the site, including a central plaza, semi-private garden for residents and a pocket park.